Dr. Dorothy Riddle has spent her professional life empowering others and gently challenging them to question limiting beliefs and assumptions. Her speaking, teaching, coaching, consulting, and writing inspires us to recognize the worth and dignity of others as well as ourselves. Her involvement has ranged from establishing the first BA-granting Women’s Studies program to conducting the first major studies on the children of gay parents and the effects of homophobia to researching “third culture kids” (like herself). She has worked around the world on services and economic development issues as well as ways to support the growth of small service businesses and humanize our work lives. 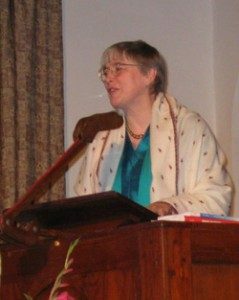 Dr. Riddle’s engagement in her community and the world has consistently focused on building bridges of tolerance and understanding among persons from different cultural, socioeconomic, and faith communities while working for justice and equity with compassion. The Enough for Us All series reflects the breadth of her awareness and her ability to integrate disparate fields into a meaningful whole and provide practical strategies for moving forward. Dr. Riddle is a leading authority on service-led business practices and her work provides a vision beyond holistic business models in order to place our business life within the context of a living and interactive universe. For more on Dr. Riddle’s work on economic development and giving back, see www.servicegrowth.com.